Something is sooo wrong with that.. I had childhood dream of being a model builder for ILM..
Or a grip, electrician, cameraman, go-fer… hell to work in any form for ILM in the 80s-90s. Shows a complete lack of substance. Both literal and figurative. 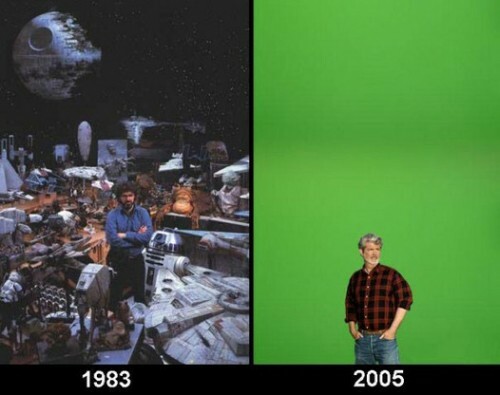 People forget the Lucas has ALWAYS pushed the technology. If computer rendering had been available, that left panel would have been EXACTLY like the right panel. He didn’t have those models because he wanted them, he had them because it was all that was available. Just because his writing skills (not great to begin with) were sadly lacking for his later work is no reason to blame the technology. Put it where it belongs – on Lucas. Using models and makeup and optical effects would NOT have made Ep 1-3 the SLIGHTEST bit better. I think you may be wrong there. What the green screen allows is your imagination to run free. Whatever you want on the screen, you get. When you have to use models that take months to produce, complex scene set-ups, thousands of hours of man power, you have to make decisions about what you really need, prioritize your work. It forces you think about the story you want to tell. This just made me giggle, sell out! Is it magic at work?